One on one meetings, 1:1s, 1 2 1s, one on ones, 1 on 1s, check-ins. Whatever you call them, they’re one of the most important things you can do as a manager. Many managers have one on one meetings with their teams, but too often, they waste them. Status updates, awkward silences, and frequent cancellations are just a few of the symptoms and causes of problems. A lack of a good one on one meeting template, or structure, prevents many from making the most of these meetings. For those of you that don’t get value from their one on one meetings, the difference is usually in your fundamentals; without good habits, and the right actions before, during, and after the meeting, it’s very easy to have your one on one meetings come up short of their potential. Many of the best leaders in business swear by one on one meetings. They feel this way because they get so much value from them. And to get that value, they follow a set pattern to make the most of them that’s very different than what bad managers do. 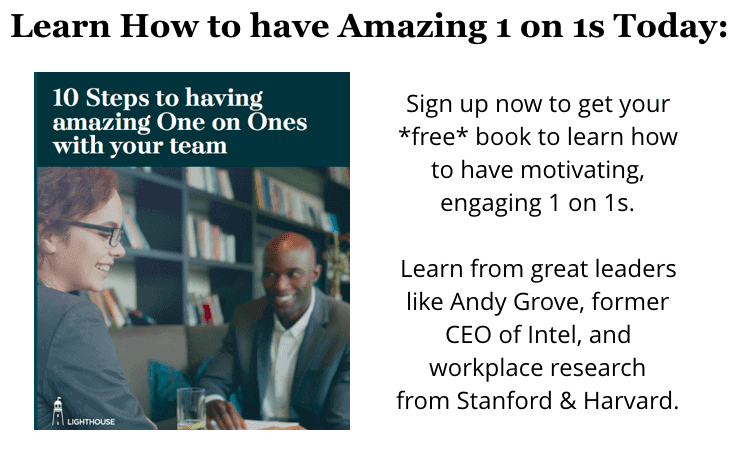 Today, we break down the one on one meeting template that is the secret weapon of so many great leaders that have motivated and engaged teams. These can help you if you’re just starting out as well as tune up your meetings if you’re looking to improve them. By following these approaches, you can make the most of your one on one meetings with your team. 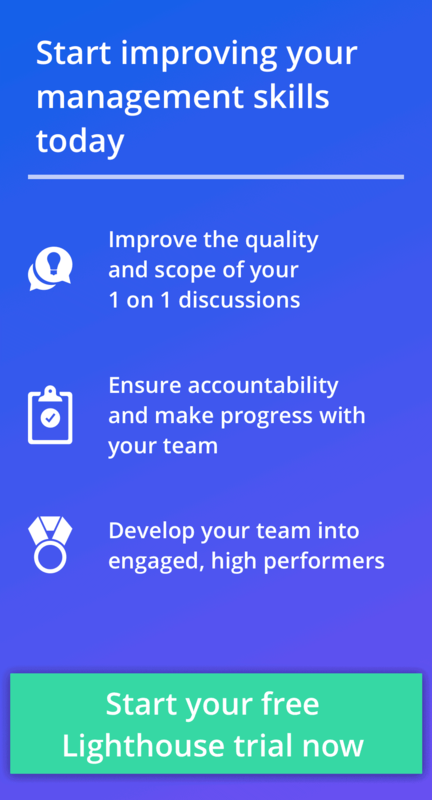 Whether you’re starting them for the first time, starting over after having given up on them, or trying to improve the one on one meetings you have, this list can help you improve the quality and outcomes of your meetings. How to use this one on one meeting template:Whether veteran or newbie, there’s something for everyone. Jump to whatever section you’re interested in or need help with by clicking the table of contents links below. Try adding some of these approaches to your one on one meetings, and check out the links for further reading to learn more of the research and leaders behind these tactics. Want help learning or keeping these good habits in your 1 on 1s? Then sign up for a free trial of Lighthouse and keep all your 1 on 1s organized and covering the right topics. Before we get into the nuts and bolts of good one on ones, it’s worth digging into the value of these meetings. It’s unfortunately rare for people to have these meetings and get value out of them, so let’s talk about what that value really is. Armed with this information, we may convince not only you, but also your colleagues or boss who are skeptical of these meetings. Better engagement, productivity, and reduced turnover: Yes, that’s right. All of those positives have happened for companies like Microsoft, Adobe, and Deloitte, as well as multi-company studies by Gallup, Hogan Assessments, and Dale Carnegie. Want to see the data for yourself, we have a whole post dedicated to the quantified value of 1 on 1s here. People leave managers, not companies: If you have a great boss, there’s a lot that can happen before you leave a company as they’ll protect you. However, even at great companies, a terrible boss will leave you running for the door. One on one meetings are one of the most important habits great managers have that helps them retain their teams. Fix low morale issues fast: When your team has low morale, it’s easy to start losing people left and right. One of the most effective ways we’ve seen managers turn things around is through very specific one on one approaches we discuss here. Over and over since we started Lighthouse over 4 years ago, we’ve seen managers learn quickly just how much of an impact these meetings can have for them. It takes less time than you think and saves you a lot of headaches later (like hiring a replacement). Be more successful at promoting from within: It’s great to have a culture that rewards loyalty and hard work of your people. One of the best ways to do so is to promote from within where possible. However, for this to succeed, senior leaders need to be invested in coaching these rising leaders, which is best done in one on ones. Fix the mess left from a failed flat organization: Many leaders hope to stay flat forever. Unfortunately, that fails as you scale (typically around 25 employees). One of the best ways to address the issue is to make sure the new leaders you have to promote to fix a flat org meet with everyone on their teams to hear their issues and frustrations. Improve or replace your performance reviews: Performance reviews have taken a lot of heat over the last few years, and with good reason: they’re time consuming and often lacking value. Companies like GE, Adobe, and Deloitte got rid of their performance reviews and replaced them one on ones. Others found that it’s the act of having one on ones that improved their reviews. Either way, one on ones are key to organizational performance. Replace failed real time feedback: It sounds like a great idea. Get everyone more feedback through a real time feedback tool. Then no one uses it, and it causes some misunderstandings. One on ones are a much better way to deliver feedback more often than an annual review. A failed open door policy: You may think because “my door is always open” that you’ll hear everything you need to from your team, but that rarely works. 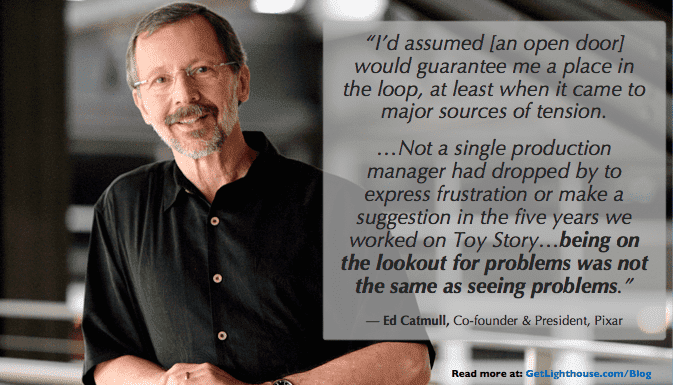 Ed Catmull of Pixar (pictured above) learned this the hard way. Your team may be afraid you’re busy, doesn’t see you in there often due to meetings, or can’t even see your door (because they’re elsewhere or remote). One on one meetings ensure you have a clear path to problems, needs, and the pulse of your team. Disconnect with remote staff: When your team isn’t in the same office as you, management is even harder; you miss out on many opportunities for ad hoc conversations. Whether you’re dealing with a partially remote or fully remote team, one on ones are essential to not missing key conversations and problems. Turn around underperformers: Turning around people checked out or underperforming takes work. They do not magically get better. One on ones are a great way to roll up your sleeves and make sure you give them the attention needed to improve their performance or manage them out of the organization with proof to HR you really tried. 1) Choose the right frequency for each person on your team. Everyone on your team needs to have a one on one meeting with the person they report to. This includes new staff, veteran staff, managers, and interns. The topics you discuss may change, but setting aside time for each team member is crucial. Size of your team: If you manage more than 5 people, it can be hard to have one on one meetings with everyone, every week. 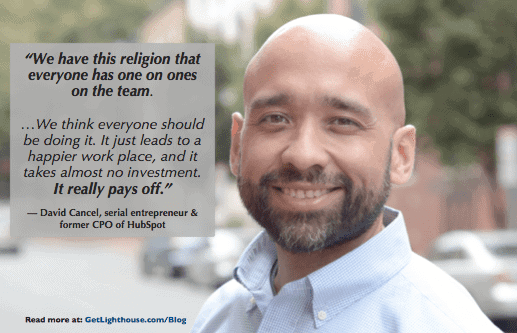 The larger your team, the less frequent you may be able to meet, but realize there will be more ground to cover each time, so budget accordingly (i.e.- schedule an hour). Their Task Relevant Maturity: This is the most important factor. If someone is new in a role, or has a new responsibility, they need more help, coaching, and guidance. Make time to meet with those on your team that are newly hired, recently promoted, or placed in a new role, every week or two ideally, even if everyone else has monthly one on one meetings. Change the frequency for each person as their roles and comfort-levels change. Your Task Relevant Maturity: If you have never done a role that is now reporting to you, you need to be more hands on, too. This gives you a chance to better understand what they do, drivers for success, and get comfortable with their work. In this case in particular, you should bring a lot of questions to the meetings so they can teach you a few things. Your Schedule: If you travel a lot, are in tons of other meetings, or have other responsibilities making scheduling hard, look to meet for longer periods of time when you do meet. You should, at a minimum, be meeting with everyone once a month (once a quarter is pointless). Otherwise, you may get blindsided by a departure, or a problem that grew too big. 2) Get the logistics right: meeting length, location, scheduling. Meeting Length: 1 hour. These meetings are more than a “quick check in.” If you really want to get the full value out of one on one meetings you need time to dig into topics. 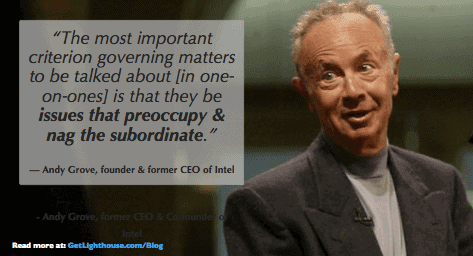 This is why Andy Grove, former CEO & co-founder of Intel, wrote the quote above about zingers. Set aside an hour. You can always end early, which is much easier than trying to stay when you have another meeting on the calendar to head to. Reschedule. Don’t cancel. It can be tempting to cancel for a number of reasons, but that does more harm than good. Your team member may say canceling is okay, but that’s more of a power dynamic than them not having something to talk about. Show your team you value the time by rescheduling to a new time soon. Go somewhere private. They’re called one on one meetings, not group meetings. If you want to dig into some of the stickier issues that come up at work, they need to be private. Heading to a conference room away from your desks, going for a walk, visiting a coffee shop, or getting lunch together are all viable options. If you’re managing someone remote, then making sure you’re in a private area for the call helps a lot. 3) Tell your team about your new one on one meeting plan. One on one meetings are focused on your team, so clearly you should explain this to them. Otherwise, they’ll think they’re in trouble, or just be nervous of what the reason is for meeting. To start, we’ll have the first one on [Date] at [Time]. We can then talk about a time that we can stick to regularly afterwards. Set a recurring meeting on both your calendars: It’s important to build a rhythm with your one on ones; part of the benefit is the knowledge that there will be a time soon to meet again. This allows you both to be accountable to what you discussed last time (as you’ll be checking progress on it), and help you both plan when you’ll have a chance to talk privately about any issues since last meeting. Avoid Status Updates: It can be tempting to spend a bunch of your one on one meeting time talking about projects, but that’s a huge waste. Get your project updates another way, so you have time for the right topics for your one on one meetings like their careers, praise, coaching & feedback, and issues pre-occupying them. If you start your one on one meetings off with good fundamentals, it will be much easier to build momentum quickly with your team. By following the above tips, you and your team members can be confident heading into them. Now that you know what to do to set the stage before your one on one meetings, it’s important you make the most of the time when you’re there. The best way to do this is to come prepared. Here’s a few ideas for the first meeting, and how to keep the meetings fresh for many meetings to come. 1) Be ready to help break the ice. The first one on one meeting will be a little awkward with each person on your team, especially if you haven’t built a lot of rapport with them yet. Talking to a sort-of stranger who is your boss can be both intimidating, and filled with uncertainty; it’s hard to tell how candid you can really be without strong rapport and trust. 101 Questions to Ask in One on Ones: These are good for anyone, but especially individual contributors that may have more helpful insights from the front lines than you realize. 81 Questions to Build Rapport with anyone you work with: If you feel like you really don’t know them well, these questions can help you get to know each other, build trust, and show you care about them as more than an employee. 51 Questions to Ask Managers in One on Ones: Your managers need one on one meetings too, and these will help with topics that can help them most. 47 Questions to Ask in Skip Level One on ones: For the advanced players, skip level one on ones are a meeting where you meet with those that report to your direct reports. These questions can help you uncover how managers reporting to you are doing, and get insights from the front lines. 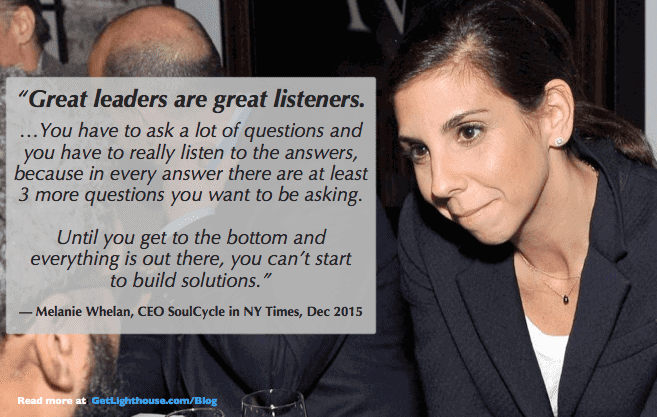 Ask follow up questions: As the CEO of SoulCycle, Melanie Whelan, said in a NY Times interview (and pictured above), your work isn’t done when you ask a question. Ask follow up questions (especially using What & How) so you fully understand their answers. You may be surprised what you discover by going beyond a first answer, and your team will appreciate you are paying attention enough to ask followups. When you come to the meeting with the right mindset and a few good questions, you help your one on ones push past the awkward and into the healthy and productive. Just like assuming positive intent, after a few meetings, you’ll be amazed how good they can be because of the discussions your questions and mindset have helped spark. 2) Bring in a variety of other good topics for discussion. Asking good questions is a key part of your one on one meetings, but don’t make the mistake of falling into a rut with them. There’s so much you can, and should, cover in these meetings that have no other time to be discussed. Build a foundation of rapport: Do you open up to strangers? Probably not. You need to get to know and trust someone before you do. It’s not different for your team, which is why it’s so important to start by building rapport with your team, or as it’s also called, psychological safety. Not sure where to start? These questions can help. Talk about their career development: Over and over again we see studies that show people want more career development at work, especially Millennials. 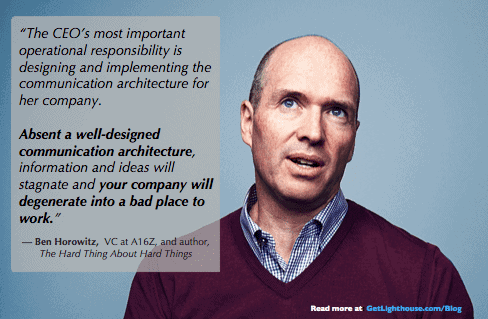 Yet, most companies fail to deliver on it and are then surprised why they lose good people. 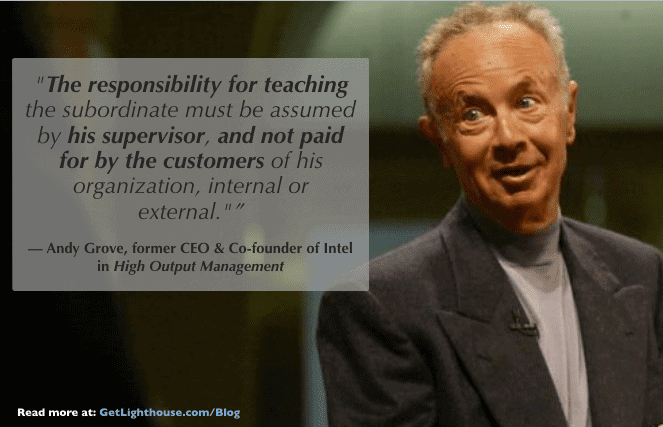 Managers that help their people grow, retain their best people for the long haul. Your one on one meetings is a great time to help people discover their goals, check in on their career progress, and discuss ways to grow when you can’t promote them. Give them feedback and coaching: As the trend grows to eliminate performance reviews, it’s clear that employees want more frequent feedback than once or twice a year. There are many ways to give feedback. The key is to take the time to give it. Your one on ones are the perfect time to go over how they can improve, and remove the fear of communication that exists at many companies. Get more feedback: Feedback should be a two way street. This means taking the time to ask your team good questions, and really listen to their answers. They’ll help you get buy for big changes, gather support for a new idea, learn how you can improve, and more. Give them specific praise: As Mary Kay Ash, founder of the Mary Kay Cosmetics empire, knows well, praising your people is a huge motivator. The key is to be specific about what you liked and to give the praise regularly. Studies show it boosts morale, motivation, output, and reduces turnover. Once again, your one on one meetings give you a great time to mention something they recently did that was awesome. Give praise, and watch them smile. 3) Demonstrate your commitment to them with your actions. All these conversation topics are helpful in your one on one meetings. Your team will appreciate you cared to ask and listened intently. However, it quickly becomes hallow if nothing changes. Take notes! Yes, it’s their meeting, but it’s your job to take notes. You need to remember what they told you that’s important to them. 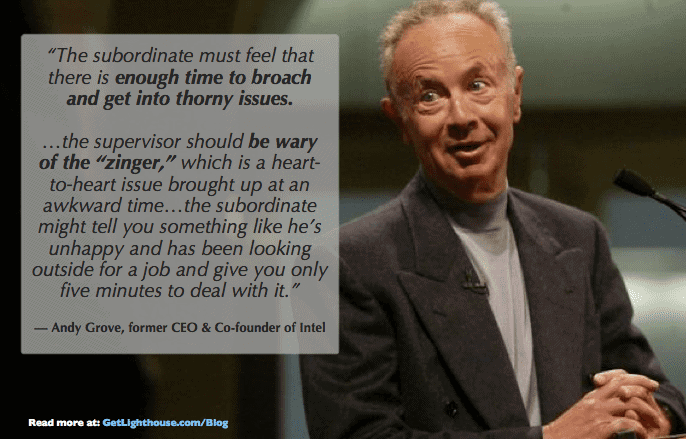 As Andy Grove wrote, “Equally important is what “writing it down” symbolizes…the act implies a commitment, like a handshake, that something will be done.” If you’re uncertain the best way to take notes, here’s a few approaches to try (the last 5 Minutes Method is my favorite). Ask one more question: In addition to worrying about zingers, the other thing you need to do as a manager is make sure you’ve fully explored a topic. Don’t be afraid to ask one more question when your team member is done talking about a topic. It can help ensure you don’t miss anything and get to the root cause. This helps you avoid costly management debt. Establish and email next steps: While you’re writing down notes, it’s important to also establish what you can both do to make progress on what you discussed. This prevents you from talking about the same thing every meeting, and makes your meetings clearly valuable. If your team sees that when you talk about something, you also do something about it, they know it’s worth it to bring up issues. Research shows that emailing those next steps afterwards then helps ensure they get done, and is key to turning around underperformers. With a few key habits in your one on one meetings, you can make them extremely productive and effective. When you cover the right topics and ensure progress is made together on those discussions, you’ll see the tremendous value in these meetings. 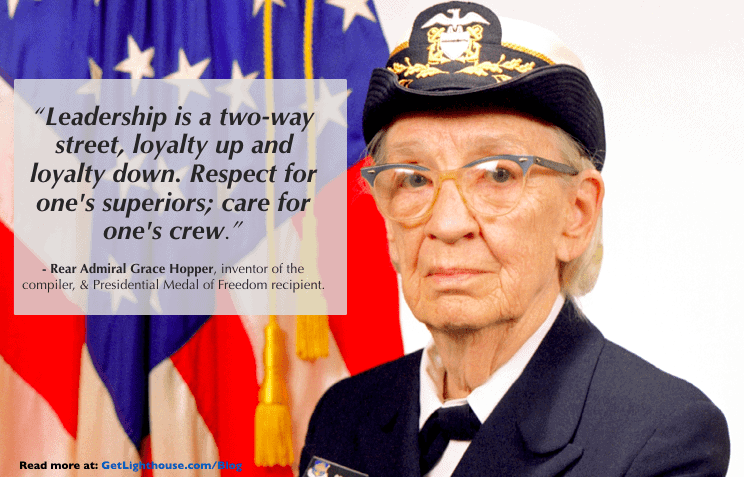 Most importantly, you’ll see a strong boost in the morale and motivation of your team. If you’ve now started your one on one meetings with the right fundamentals, and are building good habits when in the meeting, the last thing you need to do is bridge the divide between meetings. What you do between meetings makes all the difference in whether your one on one meetings get better and better, or worse and worse. When you cover the same issues over and over again, and nothing changes, or you forget altogether what happened last time, resentment will build on your team. That resentment then leads to them shutting down in their one on ones; they won’t trust coming to you with anything or answering your questions anymore. It won’t be long before you don’t hear about problems until they’re too late, or get blindsided by turnover. So here’s the key things to do instead. People may listen to what you say, but even more important, they watch what you do. The best conversation in the world in a one on one meeting will ring hollow if there’s no action, follow up, or follow through after. Keep your promises: Whatever actions came out of the last meeting, you need to do your best to take care of them by next meeting or have a reasonable explanation why you couldn’t do it. 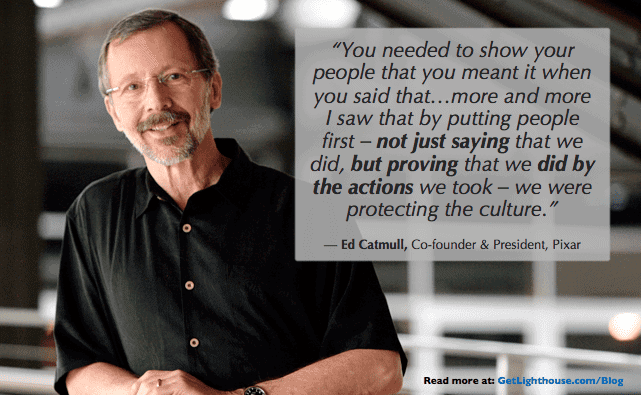 As Ed Catmull, CEO and cofounder of Pixar, wrote (and quoted above) they learned that the actions of leaders was what mattered most to preserving their great culture as they grew. Review your notes: Anything a team member tells you in their one on one is important to them. This is why taking notes and action is important. To close the loop and build a rhythm between meetings, you should review your notes. This also avoids the awkward moment of sitting down in the meeting and asking, “what did we talk about last time?” which is sure to be a downer for that team member to hear. Prepare some topics: As we’ve shown you above, there’s many great things you can discuss in your one on one meetings. However, they all require some effort on your part. A little preparation to pick out a few questions to ask, or consider an area you can provide feedback or praise can make all the difference in the quality of your meeting. Want help being prepared for your 1 on 1s? 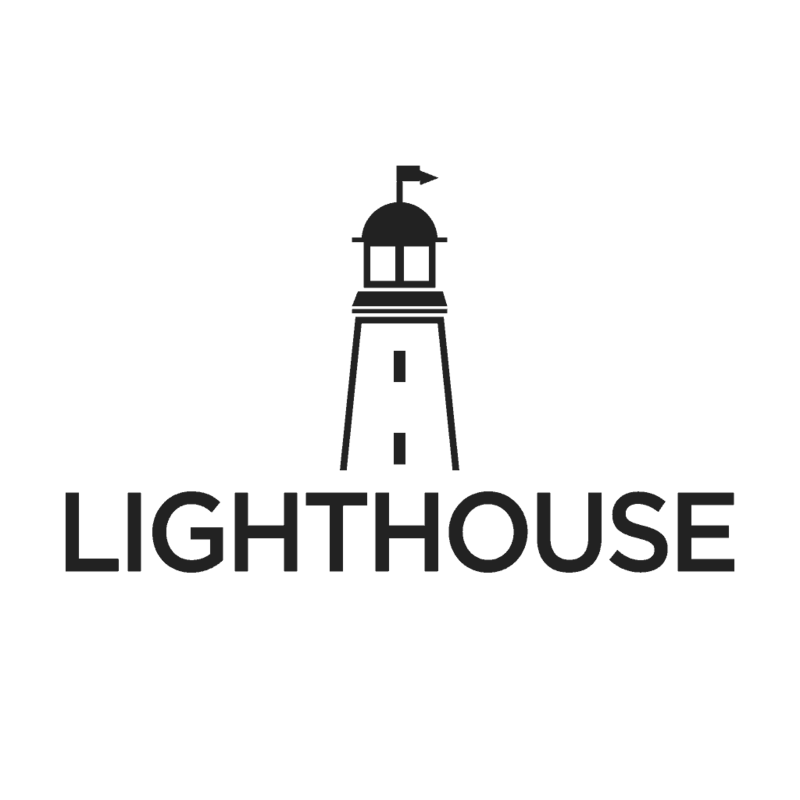 Lighthouse can send you a prep email and give you 100s of questions at your fingertips that can make your 1 on 1s awesome. Get your free trial now here. The work to make one on ones great is not all on you. One on one meetings are your team member’s meeting after all. Your team is responsible just like you for actions between meetings. 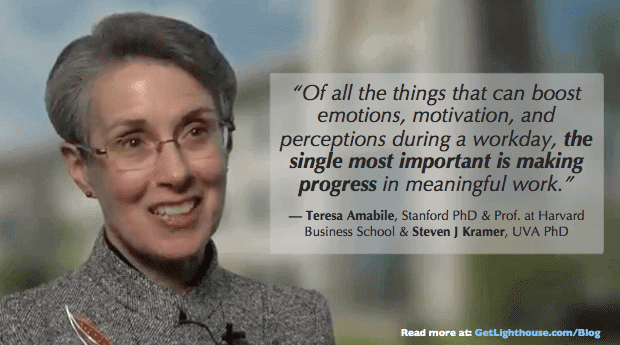 The good news is, this action represents essential progress for them, which research by Stanford PhD Teresa Amabile (pictured above) has found is essential to motivation and happiness at work. Prepare an agenda: Once you both have a recurring event on your calendars for your one on one, they know the next time you’ll be meeting. Ask them to bring topics they want to discuss. When you put in so much effort to the meeting, it’s fair to ask them to put some thought in advance as well, so you spend the time on the most important things to them. Hold them accountable: Whether you’re setting new goals for them to progress on, or the next steps from your discussion last time, it’s important they keep their promises, too. Close the loop by checking in on what was next steps last time at the start of the next meeting to ensure progress happens and take advantage of the power of repetition. This is especially helpful and important when you’re working to improve a disengaged or underperforming team member. We’ve covered a lot in this post already. For those of you already familiar with the fundamentals, these last two sections cover the common pitfalls you may have to coach others out of, as well as some advanced tactics that can take your org from good to great. The 10/10/10 rule is garbage: Quick! You have 10 minutes to cover everything important to you for the last 2-4 weeks. Squeeze in a request for a raise, a question about a project, and help on a situation that came up last week. Also, your manager is going to come a few minutes late, so it’s really 8 minutes. Sorry! The 10/10/10 rule is misguided because it tries to force an expansive discussion into a ridiculous time frame. Still not convinced? Read our 2,000+ word essay on the misguided approach. Group 1 on 1s fundamentally fail: It’s called a 1 on 1. Not 2 or 3 on 1. Bringing someone else into the meeting completely changes the dynamic. If it’s your boss, now it’s the most intimidating meeting ever for the employee. If it’s HR, then the person probably assumes they’re being fired. Group 1 on 1s remove the rapport and trust that the 1 on 1 is meant to bring between two people. Quarterly checkins are pointless: Once every 90 days is not a worthwhile frequency to meet with your team for one on ones. Too much can happen, and too much can be forgotten. If you met this infrequently, you’d have over 500 hours of work go between discussions. That’s absentee leadership at that point and your team member won’t know what’s even worth discussing. The Skip Level One on One: Once you start managing managers, you start disconnecting from the front lines of your organization. Skip level one on ones are a great way to get in touch with your team on the front lines, and get feedback on your managers so you can better coach them. These questions can help you if you’re just starting and Lighthouse can keep you organized on them. Peer One on Ones: Another way to expand and improve the quality of your communication in your organization is to meet with peers and other colleagues that don’t report to you. This can improve how cross functional teams work, reduce tensions, and build stronger relationships with key stakeholders. If you’re a product manager, they can be particularly transformative (here’s more for PMs). Practice to be effective listeners: Listening and asking good questions is a skill like any other. 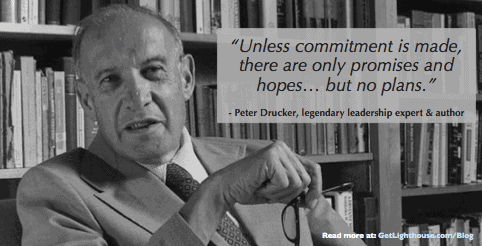 It can and must be learned for leaders to succeed over the long term. Introverts may not always open up in a group setting, so one on ones are often the best way to get the maximum insights from your team. This takes practice, which regularly scheduled one on ones ensure you have time for. To do anything well, it takes effort, and one on one meetings with your team are no exception. However, with a little organization and good fundamentals, you can make the most of this crucial investment in your people. Rather than rely on a self made system, or a paper and pencil one on one meeting template, why not get all the benefits of software? If you’d like help to build these kinds of habits and make the most of your one on ones without having to put in all the work yourself, then sign up for your free trial of Lighthouse here. Built with the best practices and research we’ve discussed today, combined with the benefits of software to remind, prepare, and structure your one on ones, Lighthouse helps you be the great leader you aspire to be.